The internet shop for bats! Submitted by Fred of The Exaggerated Zeal. Thank you! What Time Is It at Chatime? First Time. The first time I tried Chatime was early this year. Since then I have consumed about a dozen of their drinks. There are over a hundred drinks to choose from and from the few that I have tried, I keep coming back for their pearl milk tea, QQ milk tea, and strawberry milk tea (with real strawberry bits!). Tea Time. Or coffee time? Both. 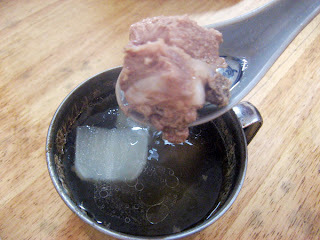 Coffee + milk + tea = coffee milk tea (regular Php 100 / large Php 110 / add Php 20 for coffee jelly). Welcome to Mustachio's Favorites Club, Coffee Milk Tea! But I must remember not to drink this at night for it will keep me up until three in the morning. Snack Time. The chicken chops sandwich (regular or spicy, Php 95) makes an everyday appearance on the menu but, shame on me, this is the first time I have tried it. Pros: tender and not at all dry. Con: Too spicy. I like spicy food but this was too spicy for me. Next time I will have the regular one. Another snack option is the fries. Potato lovers will like Chatime's fries (Php 65). Choose from three flavors: barbecue, cheddar cheese, or parmesan cheese. Lunch (or Dinner) Time. 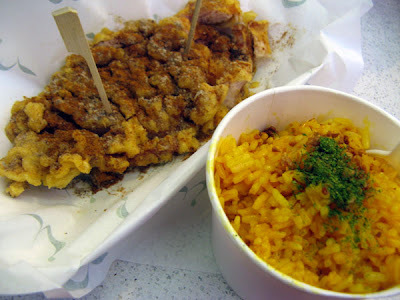 Also making an everyday appearance on the menu are the pepper salt chicken chops (regular or spicy, Php 75) and the annatto rice pilaf (Php 18). A good combination for a full meal. But if I were to choose between this and the sandwich, I will have the sandwich. Or maybe I am just saying this because at this point, my stomach was telling me to stop eating. Thank You Time. 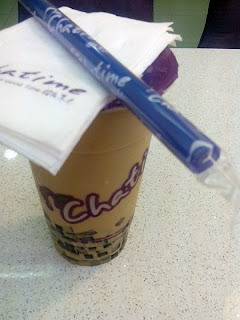 Thank you Chatime for serving me three times—tea (coffee), snack, and meal—at one time. Expansion Time. Soon it will be time to expand. 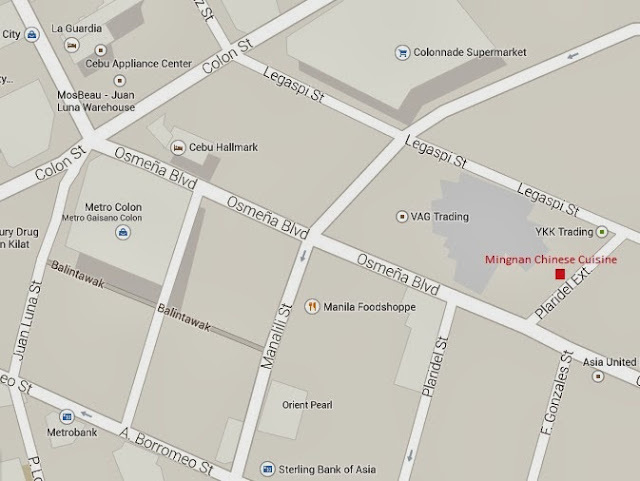 Chatime will open in SM City Cebu by December 2013. Itching to go for a swim? 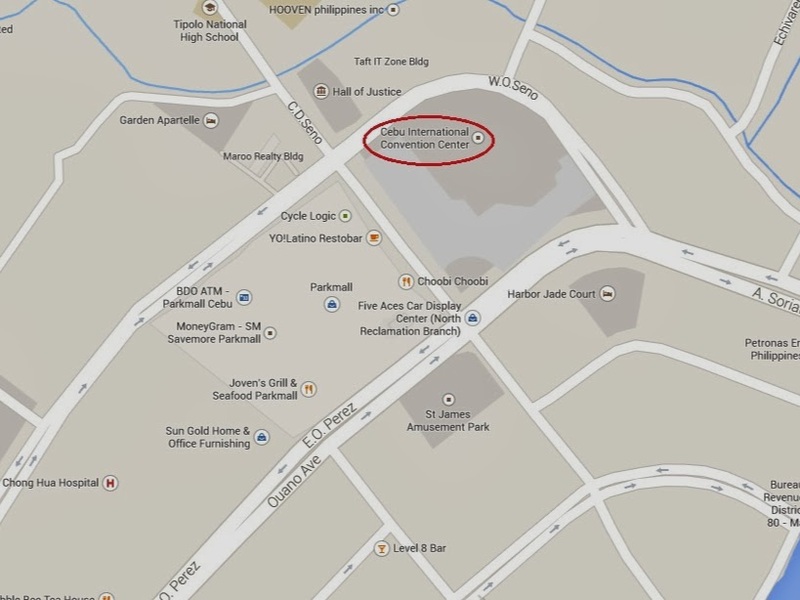 Living in Cebu City and all the above suggestions are too far for you? 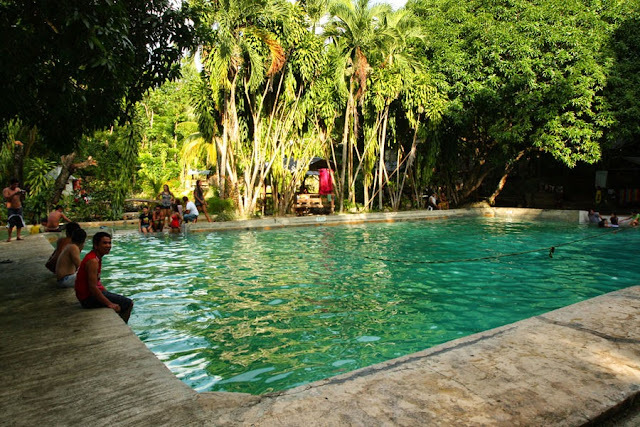 Then try the cold spring in Carmen, Cebu—Mt. Uragay Spring. 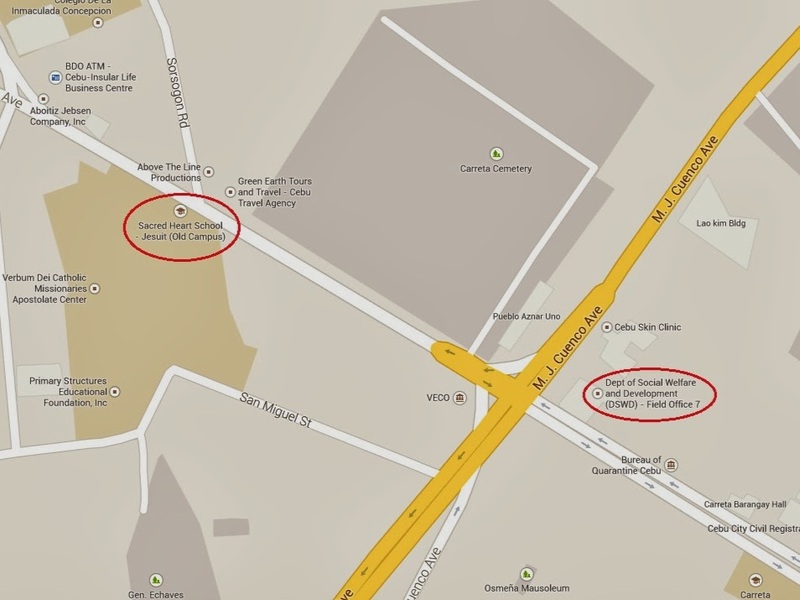 Carmen is just 40 km from Cebu City. Mt. Uragay Spring can be reached by taking a north bound bus, then alighting at the Carmen Public Market (or at the turn off before Carmen National High School, if you can spot the signboard for Mt Urugay Spring). Then take a motorcycle to the spring (if you want to walk, it's about 5km from the highway). Sorry, I can't provide estimated fares as I only hitched a ride with friends. This is a simple place with simple amenities. The basics are provided: tables and chairs or an open cottage (both for a fee), changing rooms, and a small sari-sari store at the entrance if you want some drinks and snacks. 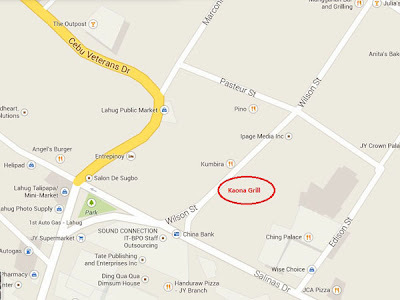 If you plan to have lunch/dinner there, best to bring your own food. Mt. Uragay Spring has two pools. The smaller one (on the mid left of the photo above) is shallow, made especially for kids. The large pool is quite deep and very cold. For those who don't know how to swim, you might want to stay on the sides or deprive kids of space at the kiddie pool. This is the story of a family and their bumbling beast, Marley, a Labrador retriever, who was with them from puppyhood to senior citizenship (13 years). I knew I'd enjoy this book after reading the first few chapters. Throughout the book I found myself smiling. 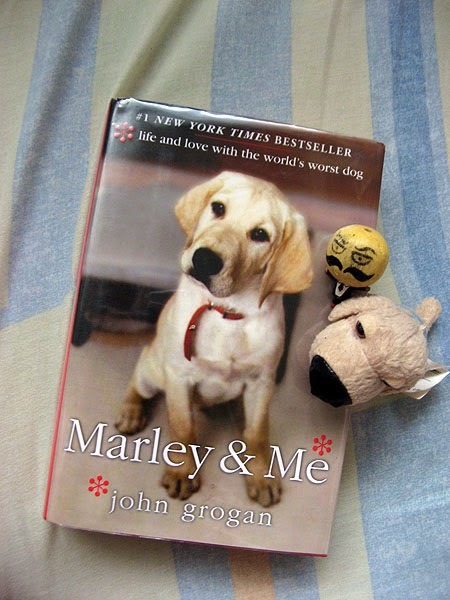 John Grogan writes with humor and affection. I think even those not so crazy about dogs would appreciate this book. 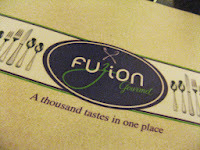 Your restaurant is kind of hidden with only the sign "Fuzion Gourmet" giving a hint of what's a few steps down and behind the door. How can you lure my friends and me into your restaurant? Start a conversation. That's what Ms Divina Veloso-Couvreux, the owner of Fuzion Gourmet, did when we were walking by in September, a week before they launched. I did not catch how she hooked my friend into a long conversation, but long conversation they had. While they kept talking and talking, another friend and I observed somebody filling tables with different types of pasta before putting on the glass top. In the course of their conversation, she handed each of us 15% discount coupons and said to take a look inside. We are such easy targets. The peek into the restaurant metamorphosed into a two-hour stay. We had dinner and desserts. I chose the chicken tajine with couscous because it sounded exotic. My friends decided to have the trusted roasted baby back ribs. What is chicken tajine? The menu describes it as "Moroccan stew with vegetables and spices served with ratatouille and couscous grain." Ratatouille is not that awesome rat cook in the animated movie, it's a French vegetable dish. Couscous is like rice but not really (oh just google it or, better yet, try it). I have no idea what Moroccan food is and how it tastes but I found my chicken tajine quite interesting, though lacking in quantity. My friends' baby back ribs were, yeah, ribs. Tender but nothing impressive. 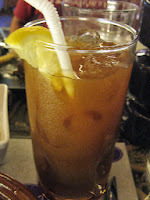 The homemade iced tea they said is brewed differently, I just can't remember how nor can I say the taste was any different from other iced teas I've had. Now for desserts: muffins (not found on their menu but in the display case), samosa, and pie. 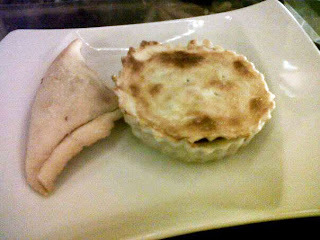 First the samosa and pie. Just Php 25 each. The samosa was like empanada in disguise. In my opinion, the only difference was the shape. The chicken pie was okay. But for just Php 25, I'll pick this over the samosa (size wins this round). Of the four, I like the muffins best! The muffins were packed (not at all crumbly) and moist. And they were big! Fuzion Gourmet claims to have "a thousand tastes in one place." Yes, the food we had were just a few, but check out their facebook page for the other 993 tastes. Maybe not exactly 993, but there are more choices on the menu, thus more reasons to visit again. 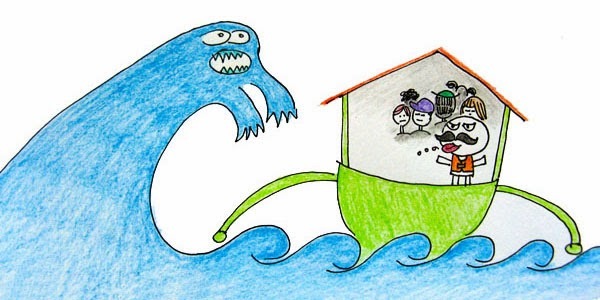 Typhoon Haiyan/Yolanda: How Can We Help the Philippines? 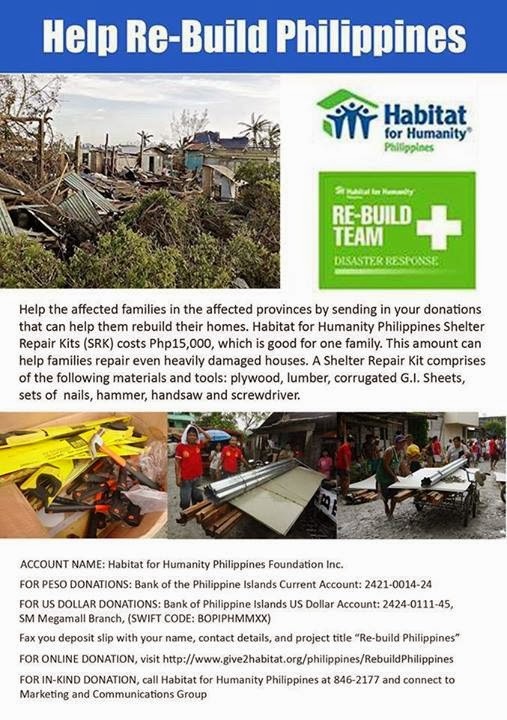 There are many donation centers around the Philippines, I am sure there's one near you. Rules: No wearing of shorts and slippers. No cameras/picture taking allowed. Starts at 11AM. Operations end on November 22. For those outside Cebu, please visit this article from Rappler to find relief operations centers around the Philippines. Donate to any of these organizations. No amount is ever too small. I know there are many small groups who are also doing their share that I missed to include in the list above. Please send me an email so I can add you to the list. What is a taverna? 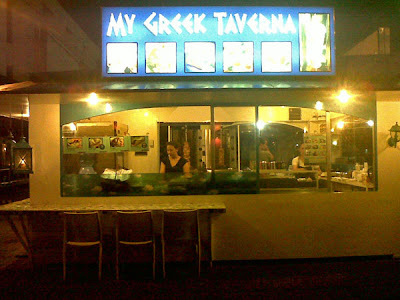 A taverna is a small restaurant serving Greek food. What is a Greek taverna? A redundancy. What is My Greek Taverna? It is...not mine. Where is My Greek Taverna? 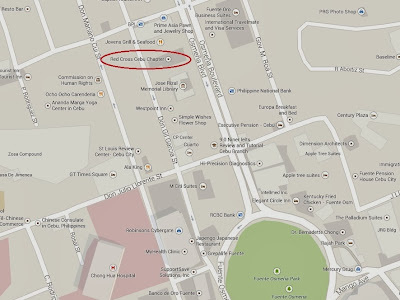 My Greek Taverna is in Mango Square, along Mango Avenue, across One Mango. Just remember those three mangoes and you'll find it. What's in My Greek Taverna? The taverna serves gyros, pitas, kebabs, and salads. 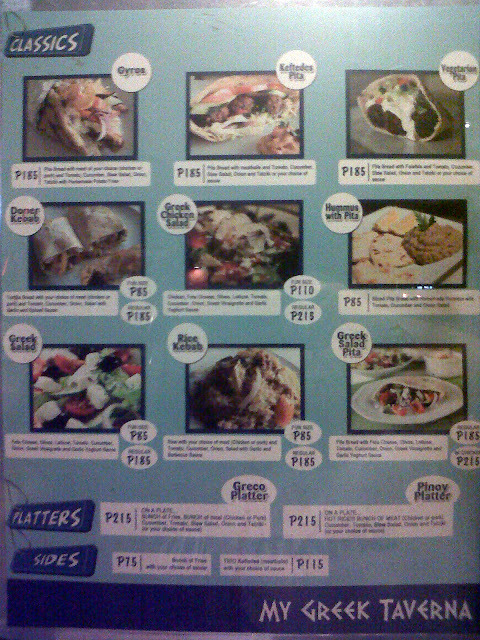 Prices range from Php85 to Php215. Please excuse the crappy photo of the menu. How's the food at My Greek Taverna? It was okay. I wasn't wowed by it. But I was wowed by the price...wow, it's so expensive! I could get twice the size somewhere else for the same price of their half serving of kebab. It won't be Greek food, but it's the same concept as a gyro/kebab. Hint: shawarma. I requested for the gyro and the Doner Kebab to be portioned into three. The photo of the Doner Kebab is just the half size. What else would you like to say? My sister did air out that My Greek Taverna could have used reusable plates for customers dining in and just use the Styrofoam containers for take out. Yeah, why don't they? 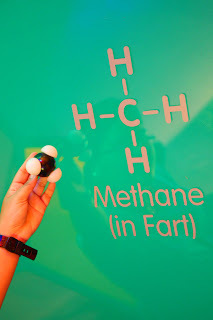 Science doesn't have to be boring. The Mind Museum agrees. The Mind Museum is an interactive science museum where guests, young and old alike, are encouraged to perform tasks in order to understand a particular concept. 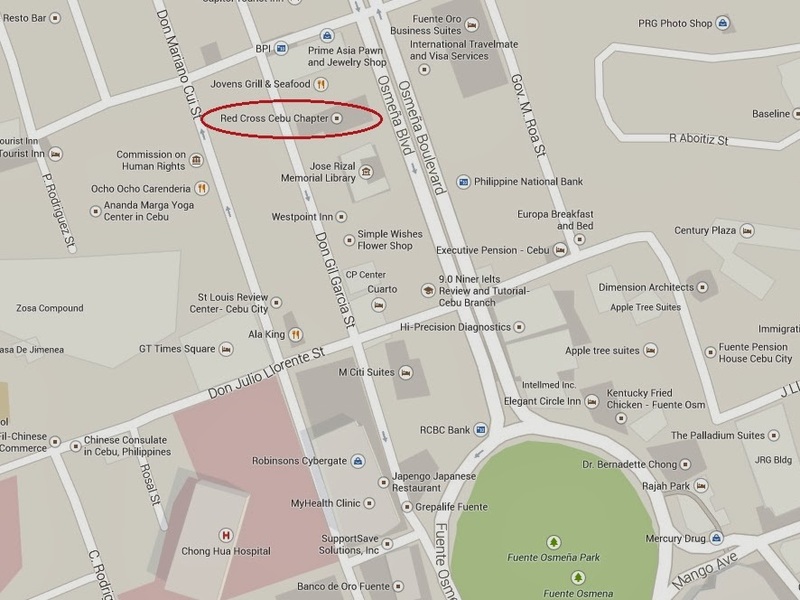 The Mind Museum is the first (and only, that I am aware of) science museum in the Philippines. Visitors can either choose the 3-hour pass (Php600 for adults, Php450 for students) or the all-day pass (Php750). There are three time slots for the 3-hour pass: 9AM, 12NN, and 3PM. For the love of science, I, the thrifty one, gave up my 600 pesos. The three-hour access pass, in my experience, gave me enough time to check out all 250 interactive exhibits in the museum. 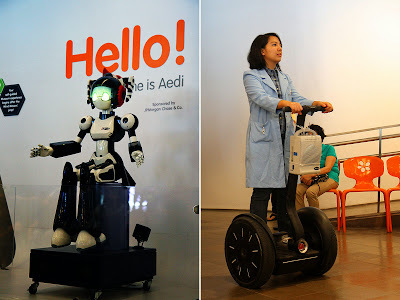 Before we began our scientific journey, we were welcomed by Aedi the robot and by Mind Movers (the museum's resident scientists) on Segways. The kids were definitely awestruck with the talking robot. 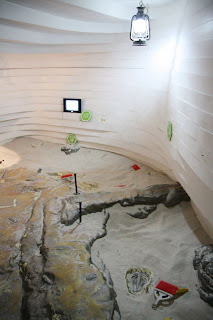 The Mind Museum has five galleries, namely: Atom, Earth, Life, Universe, and Technology. I was hoping a Mind Mover would act as a guide and explain what each gallery is about, but that was not the case. We were to learn and experience on our own. 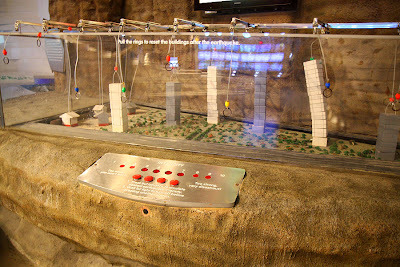 Exhibits from the Atom (left) and Earth (right) galleries. I am not going to post too many photos so as not to spoil your visit. When trying out the exhibits, do remember to be considerate of other visitors and not hog the exhibits. One must also have the patience to read and follow instructions. Do not just randomly press buttons and pull levers. One, the experiment wouldn't work. Two, you might break it. Some of the galleries show short films or have experiment demonstrations. Spare some time to watch the shows, it will be interesting. If your level of interest is not the same as mine, at least you can nap on the couch in the Space Shell while the film runs. Learning is not only limited within the walls of the museum. 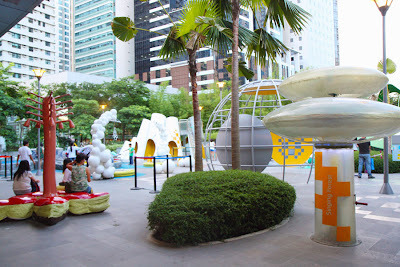 Kids will surely enjoy the park outside. There, they can learn science through play. To gain entry to the park, one just needs to present their museum pass. 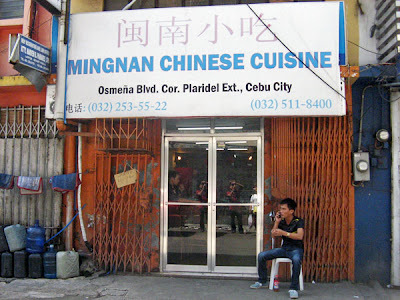 Mustachio: Bren, I need directions for Mingnan, that Chinese carenderia I read in your blog. 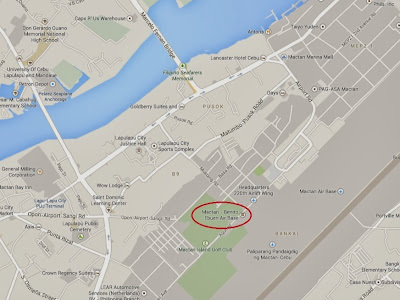 Brennan: When facing Metro Gaisano Colon, turn left and go straight. It's two or three blocks from Metro. After about two or three blocks, turn right at a small street, a street where it looks like you would most likely get mugged. Ha ha. Nice description Brennan. That doesn't scare me from looking for Mingnan. 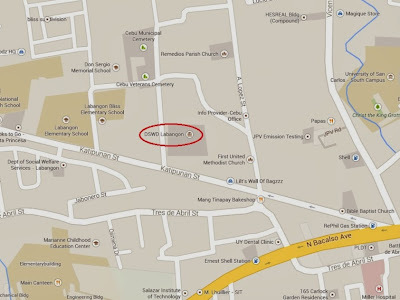 When I get to Metro Gaisano Colon, I realize there are two "lefts"—Colon St. and Osmeña Blvd.—so my friends and I play ask-random-people-for-directions game. That didn't result in anything. And then I remember Babe for Food, the blog I rely on when it comes to food. How could I have forgotten her? Justinne aka Babe for Food wrote about the same place two years ago! I send an SOS message and, thankfully, hear back from her with complete directions and some tips on what to order. Yay! Too bad, none of the dishes Justinne mentioned in her text message were available. But I am not complaining, what's available looked good too. I did not bother asking for the names of the dishes, my friends and I just pointed to whatever looked delicious. 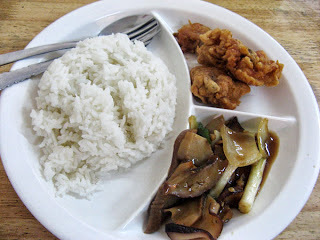 A plate of one rice and two viands costs only Php50. 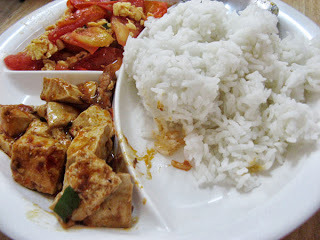 My friends and I were very happy with our lunch; flavorful food for just Php50, now who wouldn't be happy? You, Mingnan, were worth bugging Brennan and Justinne for. Cafe Caw, Is the Third Time the Charm? Third time's the charm, so they say. The first and second times I have been to Cafe Caw, at their Banilad branch, Cafe Caw failed me. On my first visit, I couldn't find value for my money. 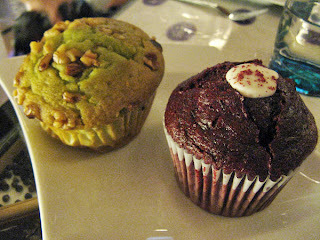 The second time was worse—I paid 60 pesos for a cupcake that was almost as hard as a rock. (I suspect it was an old batch that they forgot to throw out.) I posted it on their facebook page and the owner offered me a refund and a box of cupcakes. It was very kind of him, but I was ashamed to take his offer. 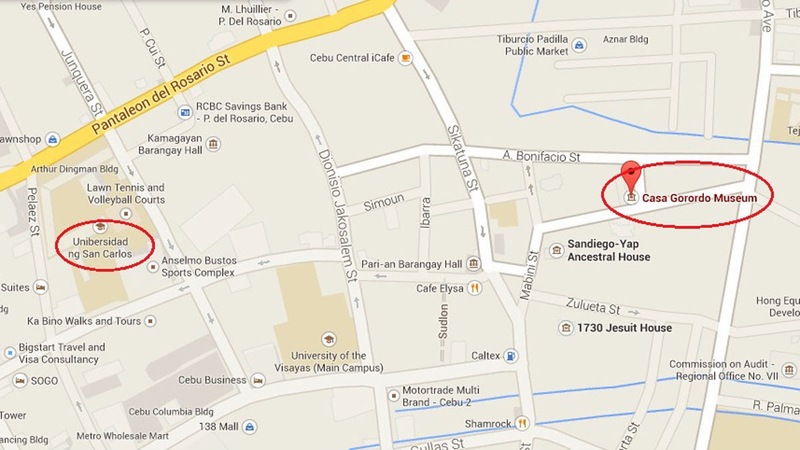 My third visit was at their newly opened branch in SSY Building in Lahug. The place had comfy settees and ottomans, which means (if you have been to their Banilad branch) that the Lahug branch is bigger—five times bigger—but with the same pastel–colored interiors. At their new place, it wasn't the interiors that caught my eye; it was the display case containing drool–inducing cakes. Cakes I had not seen in their Banilad branch. Cakes which I did not take a photo of (it slipped my mind). The hosts (I was invited by a couple to come along to the cafe) ordered two drinks and the chopping board, which is a collection of five goodies: one cake, two cupcakes, one cookie, and one bar. I actually don't know what they call the set, I just called it the chopping board for all five goodies are served on a wooden chopping board. Blueberry cheesecake. I am not a fan of cheesecakes but the female half of the couple said it's one of the best cheesecakes she's tasted. Choco oatmeal bar. Loved the gooey fudge. Choco chunk cookie. Chocolate chunks, yessirree! Yum! Green tea cupcake. The cupcake did have a hint of green tea, but much as I like green tea, I probably wouldn't care to have this again. Mocha cupcake. The cupcake had a moist chocolate cake bottom and mocha icing. 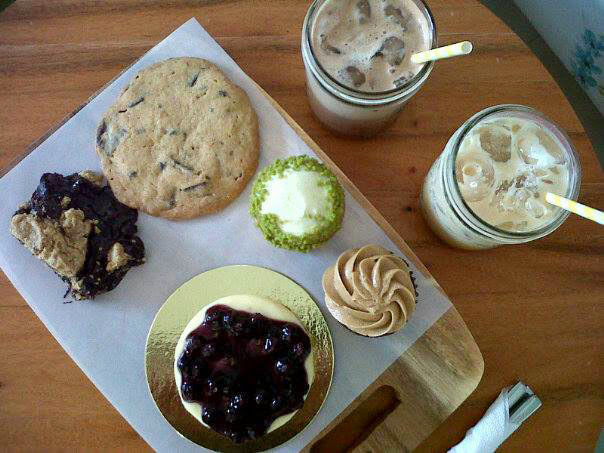 The chopping board set could make at least four dessert–loving people happy. I did not get to try any of the drinks but the couple did say the drinks were too strong for their taste. The verdict: Charmed. Yup, third time's the charm. I'm snoozing under the covers in the huge room on the 22nd floor of Mövenpick Hotel when I am rudely awakened by a grand shake and the sound of things crashing... Ha! Just a dream (being at the penthouse) and a nightmare (the hotel crumbling to pieces with me crashing along with it). True, I am in Mövenpick Hotel, but in a room just five floors aboveground. A relief, given it has only been a week since the earth shook. And a disappointment; I was half hoping to be put up in the penthouse or whatever they call the room at the topmost floor. I am here to act as a guinea pig, might as well put me to the ultimate test. The goal here is to survive (along with all three Mövenpick towers) the aftershocks and assure everyone, or at least everyone who cares to read our blogs, that the building is still safe after that strong earth shake. Before the survival test, Mövenpick's General Manager, Mr. Knuth Kiefer, assures us that the hotel has been structurally designed beyond the local building code. In layman's terms, no need to worry. The assurance is paired with a Churrasco dinner at Mövenpick's Ibiza Beach Club. Churrasco is, to quote the hotel, "a Brazilian–style barbecue laden with mouth–watering fire–roasted meats and seafood, cooked in a churrasco grill and served from a sword–like skewer at your table." Before the grilled fare is served, we are given a plate with garlic rice, vegetables, and beans, and a separate plate of four condiments for the grilled meats and seafood: chimichurri, butter, red wine butter, and herb butter. Each guest is given a disc, with one red side and the other green. Turn the disc to green to signal the server to start carving the meat, and turn it over to red for stop. Salads can be had before diving into the meats and seafood. Please excuse the color cast. I do not get to flip my disc to green but the servers wielding sword–like skewers come one by one: lamb chop, rib eye, filet mignon, lamb leg, pork belly, pork rib, chicken, ostrich, fish, squid, lobster, prawn. Each one is mighty scrumptious. I think I will lose this battle. By dessert—churrasco pineapple with yogurt, honey, and pistachio—I am as weak as an overfed pig. Weak but, still, I manage to wipe my plate clean with the last bit of pineapple, and pat my happily bulging stomach, "We are done." Wrong. Something else comes our way: a scoop of maple walnut ice cream, which is not part of the churrasco dinner. I hastily make some space for this creamy, generously sprinkled with walnuts, delight. I spoon some in my mouth, and another, and another. If I had more space, I would have easily finished two or three more scoops. Best ice cream I have ever had. Congratulations, tummy, we are still alive. Those skewer–wielding people almost killed us with their delicious swords, but we are tougher than we look. Again, please excuse the color cast. But we don't act so tough when we encounter SSB—sakit sa baboy. It's time to hit the sack. Nice, comfy, fluffy sack that is. In my room on the fifth floor, I draw the drapes close, snuggle under the covers, and sink (literally) in my pillow. Sweet slumber. And then a big jolt. I sleepily crack my eyelids open, listen to the walls shake, and reach for my watch: 2:42AM. This time it's not a dream. But I remain in bed and wait for the shaking to die down and switch back to hibernate mode. I am awakened at 630AM. By my alarm. Hey, I'm alive. And the three towers are still standing. After a quick shower, I head down for breakfast at The Sails: A glorious spread of breads, cheese, cereals, waffles, bacon, sausages, eggs (omelet with mozzarella cheese! 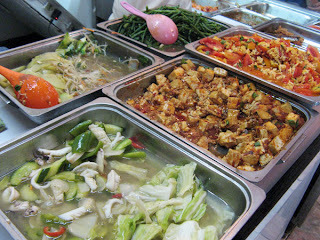 ), soup, salad, yogurt, fruits (lots! ), juice. 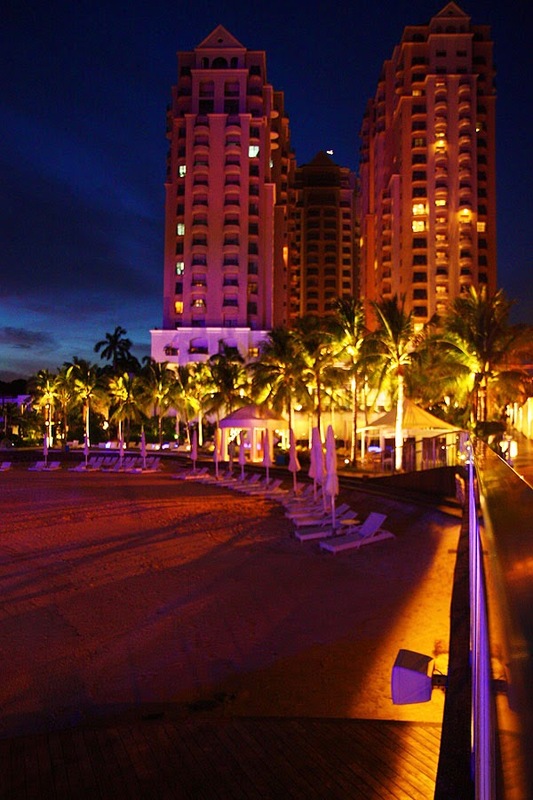 Then explore the hotel one last time to admire the well–maintained beach and pool, and to survey the game room. I check out early, say goodbye, and rush to work. That part I wish were just a dream. I would have happily stayed under the sheets all morning, with just a short break from bed to have that sumptuous breakfast in between. Thank you, Mövenpick, for that impressive experiment. I am one happy guinea pig. Was I was worth this experiment? 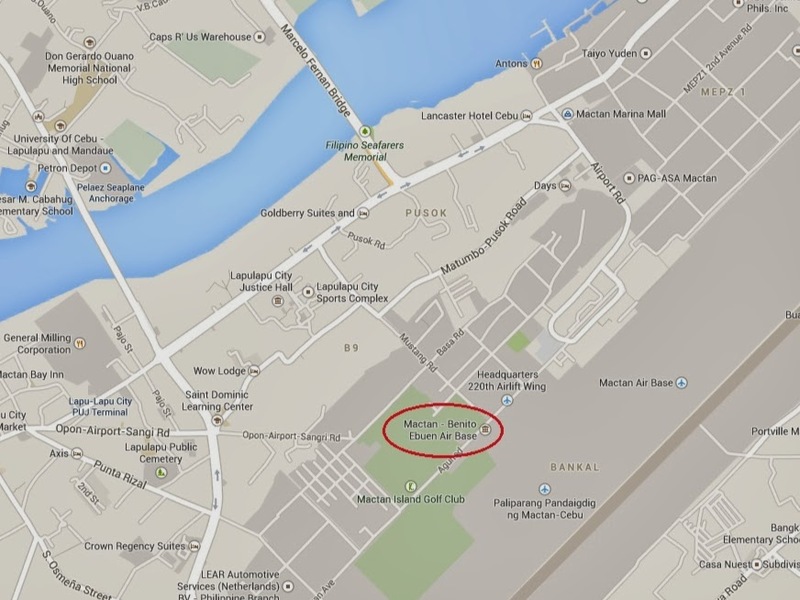 I hope Mövenpick thinks so. 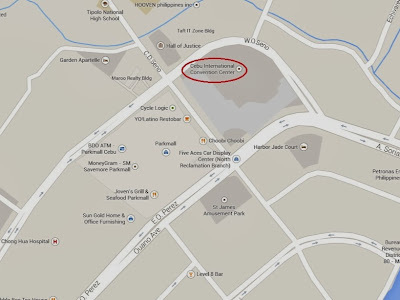 Rooms at Mövenpick start at Php7800, inclusive of breakfast for two. 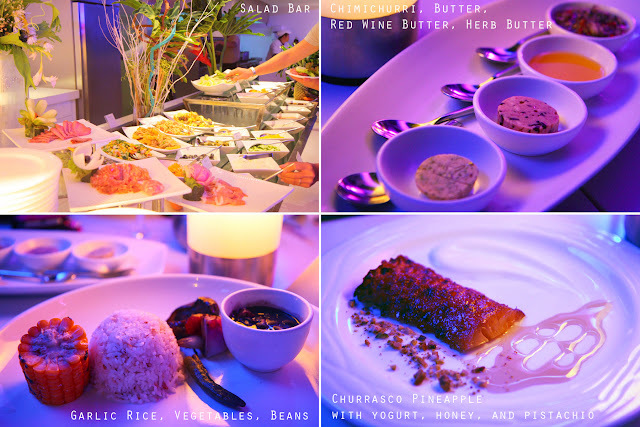 Churrasco dinner (all you can eat salad, meats, seafood) costs Php2000. Add Php500 for bottomless wine. 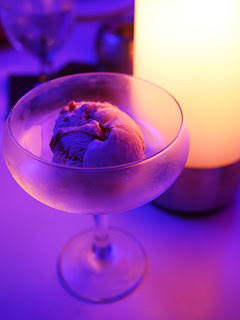 A scoop of maple walnut ice cream for about Php300. If you can't decide where to eat, ask the locals. If you can't decide where to go, ask the locals. If you can't decide where to sit in a boat, follow the locals. A local is your best compass. If you can't decide where to eat, ask the locals. In tiny towns, I usually just ask the hostel attendant or the tricycle driver where I could eat. In Hinatuan (Surigao del Sur), I was pointed to Drawde's Kamayan. It looked like a simple carenderia, but don't let the facade fool you. They serve really good food! 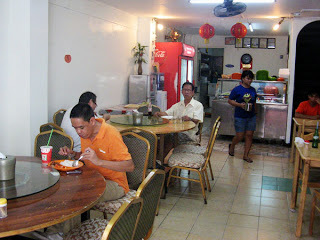 I especially loved the fresh shrimps (a heap for just Php 50)! If you can't decide where to go, ask the locals. When we went to Kawasan Falls last year, it was closed to the public. We could not think of an alternative that was close by and asked around for suggestions. An old man suggested "Canyoning falls." That suggestion took us to Canlaob river (by "Canyoning falls," he meant Canlaob) — a refreshing discovery. If you can't decide where to sit in a boat, follow the locals. On the boat from Carabao Island to Caticlan, we could not decide whether to sit on the left or on the right side of the boat. We just followed where most of the locals sat and it turned out to be the right decision. They were sitting on the side away from the big waves, therefore staying dry the entire boat ride.